The 2018 ECOS Annual Report is a visual summary that highlights a number of regional trends and accomplishments. The CCRPC’s monthly newsletter is a compilation of the latest local, regional, and statewide updates, including events, project updates, and more. The purpose of the survey is to objectively measure public opinion regarding performance of the region’s transportation system and identify strategies to address existing and future deficiencies. 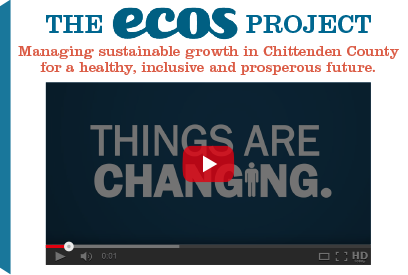 On June 20, the CCRPC adopted the 2018 ECOS Plan, the Regional Plan, Comprehensive Economic Development Strategy, and Metropolitan Transportation Plan for Chittenden County. A transportation study of the entire Winooski Avenue is getting underway as Burlington looks to create multimodal, Complete Street routes throughout the city.